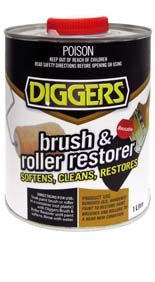 Diggers Brush & Roller Restorer is a new specialty solvent that softens, cleans and restores paint brushes and rollers to bring new life into old equipment. The formulation will not damage the bristles or rollers and is the fast acting solution to restoring old/ forgotten painting equipment that might otherwise have been thrown away. It is suitable for use on enamel, lacquer, water and oil based paints and is also a highly effective clean up solvent for fresh paint. The product is simple and easy to use. Simply soak the painting equipment in a non-plastic container and then rinse out with water. No additional soap or detergent is required. Another handy and cost saving feature is that the product is reusable. Once the paint has settled at the bottom, the clear liquid can be poured into a container and used again.